Performers include: Edward James Olmos, Mary McDonnell, Jamie Bamber, James Callis, Tricia Helfer, Grace Park, Katee Sackhoff, Michael Hogan, Aaron Douglas, Tahmoh Penikett, Alessandro Juliani, and Kandyse McClure. After a catastrophic attack from humanoid robots called as Cylons, the surviving humans of the Twelve Colonies of Man search the galaxy for the fabled 13th colony — Earth. Commander William Adama (Edward James Olmos) and President Laura Roslin (Mary McDonnell) lead the small fleet of ships while being pursued and unknowingly infiltrated by Cylons. 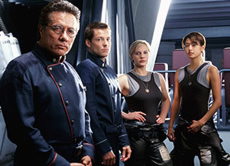 Other important characters include Captain Kara “Starbuck” Thrace (Katee Sackhoff), Commander Lee “Apollo” Adama (Jamie Bamber), Colonel Saul Tigh (Michael Hogan), and scientist Gaius Baltar (James Callis). A re-imagining of the 1970s sci-fi series of the same name. The show was designed to be a short run series from the outset. It ended in the manner that the show’s production crew wanted it to. has this show been cancelled ??? we are in 2014 !!! and it has’t season 5 since then !! Yes, it ended years ago. Best show! Worst cancellation ever. Don’t the people that cancelled it ever get cancelled? Don’t they have a fantasy life? I guess for fun they play board games…. Please for my dad’s sake please don’t cansole this t.v show. By the way is almost fathers day that would be god fathersday present if you keep this show going and not cansole it.